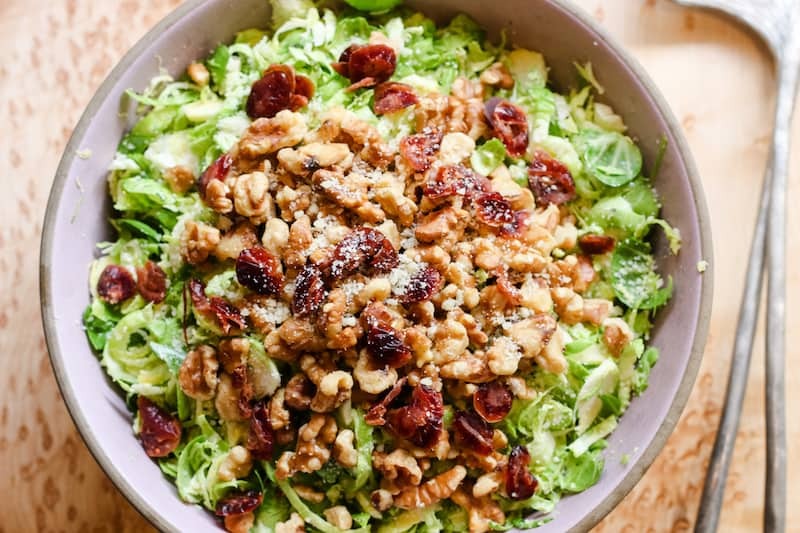 I adore Brussels sprouts, especially roasted up with bacon and apples, but it’s the time of year for healthier eating, so I thought I’d share my favorite shaved Brussels sprout salad recipe. Brussels sprouts make a nice alternative to the same old lettuce, and create a crunchy slaw that’s perfect as a side dish or a lunch of its own. If you decide to add bacon, I won’t be mad, ’cause that would be delicious. 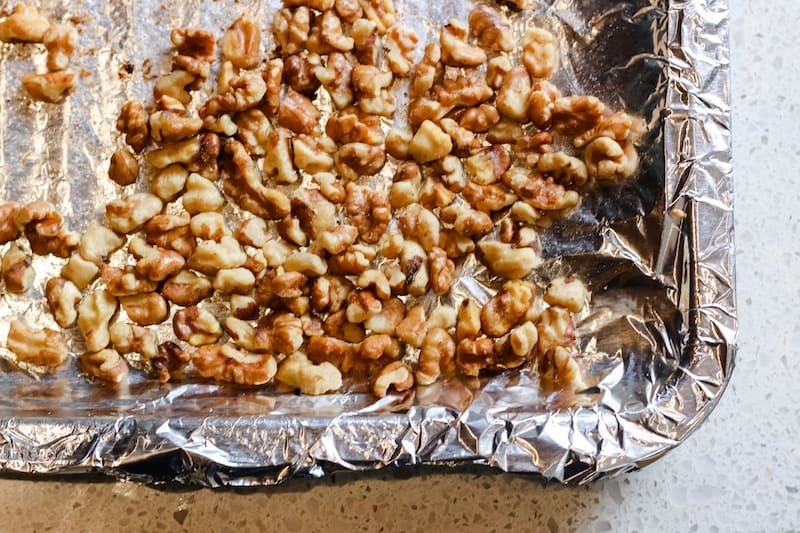 First you’ll want to toast your walnuts. I throw them in the toaster oven set to 400 degrees F for about 5 minutes. Just keep an eye on them. You can shave the Brussels sprouts with a mandolin, just leave the stems on so you have something to hold them by. I have had one too many run-ins with my mandolin (still recovering from partial thumb removal while making scalloped potatoes on Christmas Day), so I prefer this method, which is actually faster too. First, I slice the stems off the Brussels Sprouts with a knife. Then I run them through the food processor with the slicing blade attached. 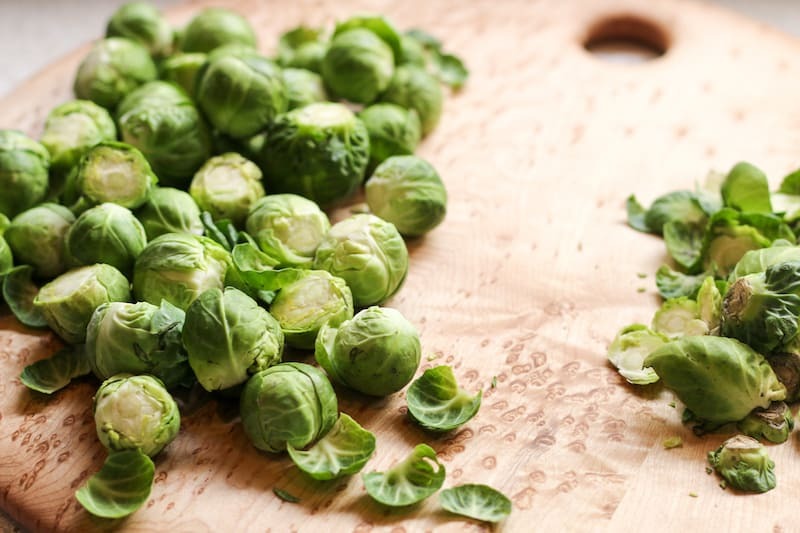 It takes about 2 minutes, and the brussels sprouts are shaved into thin, crunchy, delicious little strips. 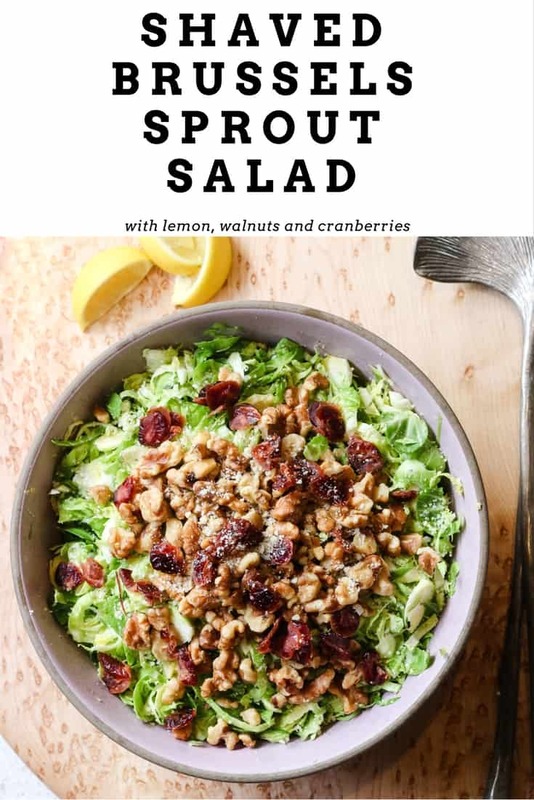 IMHO opinion, it’s the best method for making this shaved Brussels sprout salad recipe, or any recipe that calls for shaved Brussels sprouts. 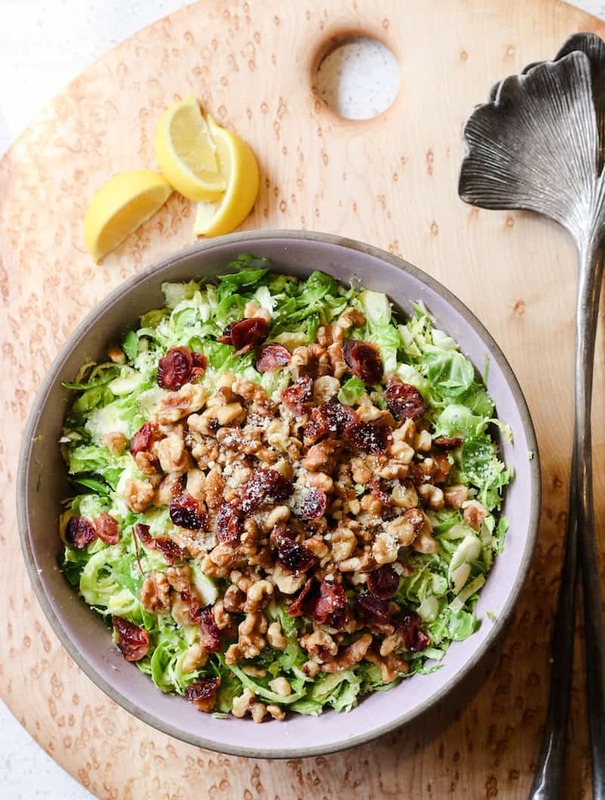 Once your walnuts are toasted and your Brussles sprouts are shaved, it’s just a matter of tossing it all together with the olive oil, lemon juice, dried cranberries, and parmesan. So delicious, and so easy to make. 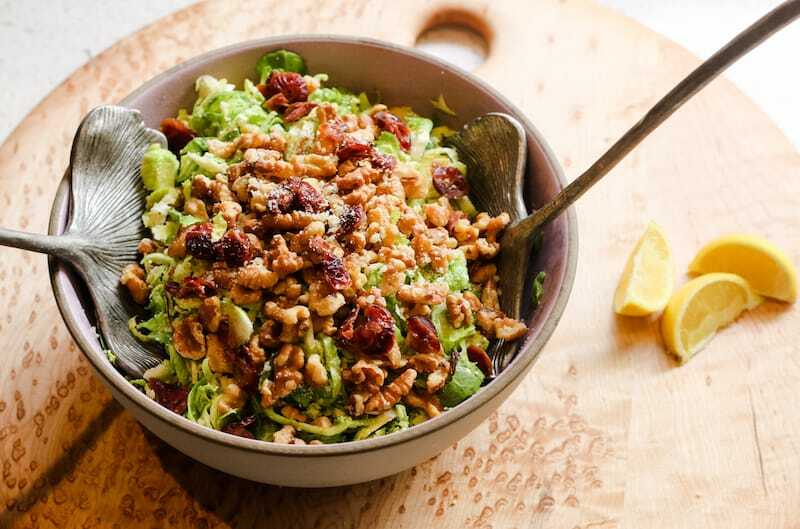 A crunchy slaw made of shaved Brussels sprouts with walnuts, cranberries, lemon, and parmesan cheese. Toast the walnuts. 3-5 minutes at 400 degrees should do it. Shave the Brussels sprouts. If using a mandolin, keep the stems on to use a base to hold the sprouts as you shave. 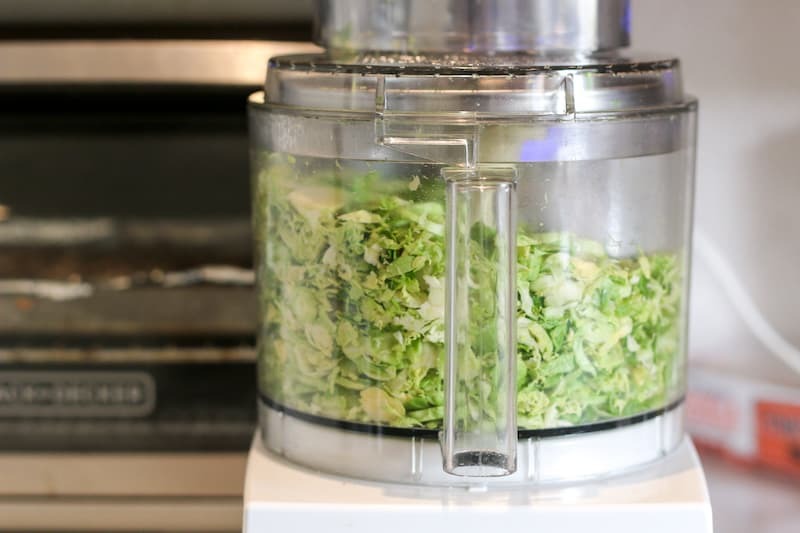 If using a food processor as described above, cut the stems off first.